At Watts School of Nursing, “A Tradition of Excellence” is much more than a catchphrase. It’s the timeless standard of the school for which Watts graduates are known. Since its inception in 1895, Watts has focused exclusively on nursing education for entry into professional nursing practice. Throughout its history, the school has shown exceptional ability to meet the changing needs of students, health care consumers, and the nursing profession. Now more than ever before, the school is embracing change with a future filled with great promise and expectation for continued excellence in nursing education. Watts School of Nursing, organized and incorporated in 1895 as part of Watts Hospital, was donated and endowed by George W. Watts for the people of Durham and Durham County. 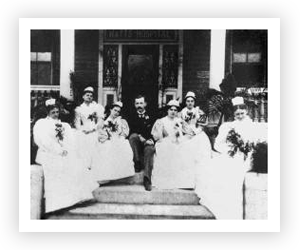 At the dedication, Mr. Watts indicated that the hospital was to be used for the care of the sick and the training of nurses. The school began its mission as a two-year diploma program, graduating the first Watts nurse in 1897. Embracing an opportunity to enhance the program, Watts developed an articulation agreement with the University of Mount Olive in 2004. In 2007, Watts moved into its current facility, which allowed the school to increase its enrollment. Throughout its history, a collective spirit of caring, professionalism, and excellence in nursing has carried forth with each generation of Watts graduates. Today, Watts has a long-standing reputation for excellence in nursing education and the distinction of being the oldest nursing program in North Carolina with over 3,700 graduates. The school continues to position its program for the future while preserving the best from its past. Watts is conveniently located on Croasdaile Drive, which affords easy access to major highway exchanges. Designed specifically for the nursing program, the school offers an academic environment that is spacious and engaging with comfortable classrooms, airy conference rooms, and inviting administrative, staff, and faculty offices. See Contact for address and map.